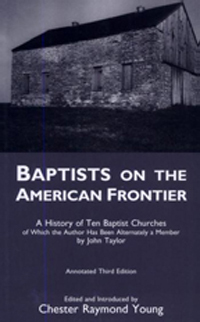 John Taylor's account of religious life on the American frontier of the late eighteenth and early nineteenth centuries, long recognized as a significant primary source for the study of the history of Christianity in American, especially the history of Baptists, is available here in an annotated version. The annotated third edition of Taylor's History of Ten Baptist Churches features: A critical version of the text from the first two publications, A logical division of Taylor's sentences and paragraphs, A complete bibliography of Taylor's writings, A full bibliography of relevant historical works, And an analysis of frontier religious rhetoric, including tables. Editor and introducer Chester Raymond Young clarifies and corrects Taylor's account by an extensive system of annotation that: Explains outmoded usage of words, Sketches biographies of persons in the text, Locates geographical sites, Defines religious terms and theological systems, Gives biblical references, Demarcates regions of settlement and routes of travel, Identifies congregations and association, Distinguishes between the texts of the first two editions, Corrects errors, Solves problems of chronology, Makes analogies, Documents the sources used by Taylor, And cites additional bibliography.